Swarovski Beads: Swarovski Crystals and Swarovski Jewelry and Austrian Swarovski Crystal Stores. You are viewing UMX > Beads > Swarovski Beads: Swarovski Crystals and Swarovski Jewelry and Swarovski Crystal Stores. Swarovski is the kingdom of crystals. Daniel Swarovski is the founder of Swarovski Crystals and Swarovski World with the swan logo on their products. As king of crystals, Swarovski invented an automatic crystal cutting machine at the end of the 19th Century. He invented a breakthrough technology of how to cut crystals into a variety of complex and fashionable jewelry shapes, like faceted diamond, sphere, cube, teardrop, faceted round, and flat shapes. By adding the extra technology of coloring the crystal, Swarovski transformed the crystal world of fashion and beauty into a sparkling universe. He opened the door to a world of fantasy - Crystals. Crystal, which even the most ancient cultures ascribed as beneficial, valuable, and indeed miraculous properties. It inspired the human race and enriched both art and culture. Today the seductive crystal has become part of the connection between people. Nowadays crystals are used to make jewelry, necklaces, bracelets, chokers, brooches, binoculars, earrings, rings, spotting scopes, ornaments, chandeliers, tiaras, rifle scopes, watches, clothing, pins, and all kinds of fashion products. 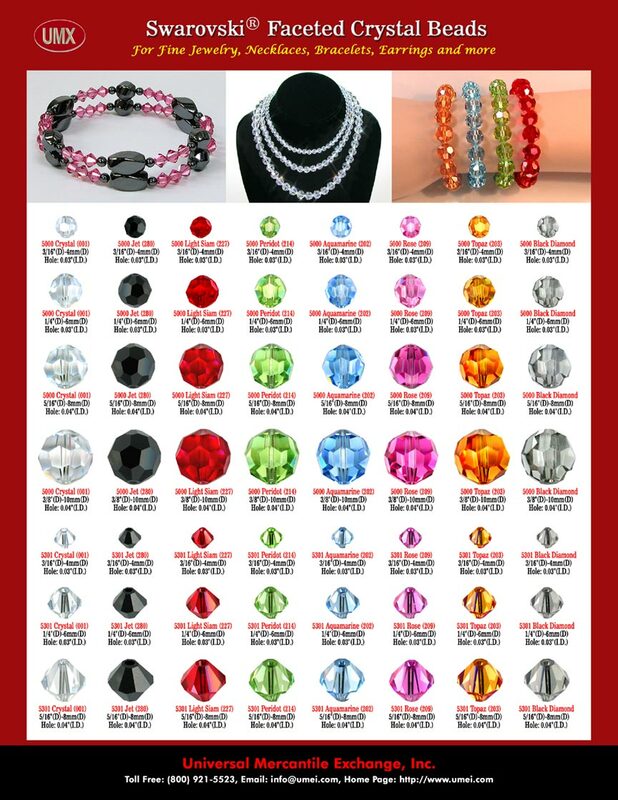 Please check our online wholesale catalogs for more Austrian Swarovski beads, genuine Swarovski crystals, and Swarovski jewelry supplies information. Big Photo: Faceted Round Crystals and Faceted Diamond Crystals: Swarovski Crystal Beads: Jet, Light Siam, Peridot, Aquamarine, Rose, Topaz and Black Diamond Austrian Swarovski Crystal Beads and Genuine Swarovski Crystal Beads. You are viewing UMX > Beads > Swarovski Beads: Austrian Swarovski Crystals, Swarovski Jewelry and Swarovski Crystal Store.